Made from Polisport’s proprietary Durable Gloss Polypropylene (DGP). Injection molded for precision fit to match OEM. Several colors available that match original year color. Pre-drilled mounting holes are precisely placed for easy installation. 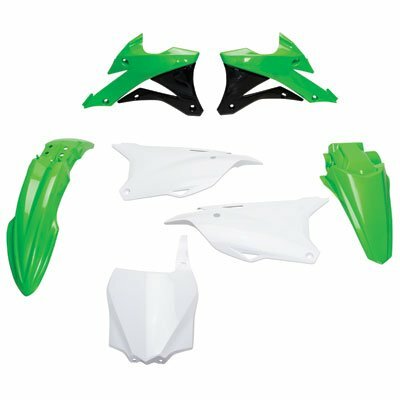 The Complete Replica Plastic Kit from Polisport is a good way to be sure you get quality, factory-accurate plastic while you dress up your bike. With years of production experience, Polisport is in a position to create great-fitting, great-taking a look plastics that can provide a fresh look to the most worn out bike. Every set is precision fit to a specific make and model, providing an install that’s super easy and a clean, straight off the showroom floor look. Pre-drilled mounting holes, an accurate shape, and matching factory colors round out each set of plastics for a finished appearance. And because Polisport’s manufacturing processes are so highly refined, each Durable Glass Polypropylene (DGP) body panel that rolls off the line has consistent strength, wear, and color. Several colors to be had that match original year color. Pre-drilled mounting holes are precisely placed for simple installation. Gives a clean factory look. Excellent strength with durable wear and even colors.